"I am the oldest young designer in New York City." It was a hot day in New York yesterday, but that didn't slow down fashion enthusiasts flocking to the city. The spring 2014 designs seen at the Michael Kors show mid-morning were reminiscent of clothing worn in the 1940s. Not only did the prints give a nod to the decade, but so did the silhouettes. Wartime in the 40s led to fabric rationing, which greatly impacted clothing production. Dress lengths were raised and clothing was worn closer to the body to save on yardage. To give his designs that 40s flare, Kors kept some hemlines just below the knee and waistlines above the belly button (think 40s swimwear). "Michael Kors has gone romantic!" said Kors when referring to his latest collection to walk the runway. “It’s that forties versus seventies moment!” Loving all things retro, Kors's collection blew me away. Later in the day, models geared up to walk at the Marchesa show. "It was this idea of curiosity cases, full of birds and butterflies," said Marchesa co-founder Georgina Chapman. As always, the dresses were extravagant, romantic, and full of exquisite detailing that would highlight any woman's femininity. Often worn by celebrities on the red carpet, designs by Georgina Chapman and Keren Craig (who happened to meet at Chelsea College of Art and Design in London) are inspired by the Italian heiress Marchesa Luisa Casati. 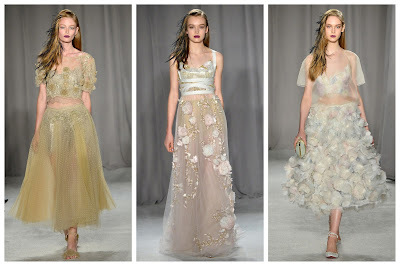 If I had the financial backing, I would don a Marchesa dress every day of the year. Tonight marked the end of New York Fashion Week and for the grand finale, cue . . . Marc Jacobs. Always beating to his own drum, Jacobs's new spring collection is very dark. As Marc Jacobsites fanned themselves while they waited patiently for the show to begin, a creepy soundtrack worthy of a Tim Burton film slinked through the speakers. Out walked, or rather speed-walked, the models down the winding runway. Floor length black lace dresses with a hint of sparkle, board shorts paired with military-inspired jackets, and a print you'd likely see on a floral Hawaiian muumuu were all on the agenda. Only Jacobs can take all that hodgepodge, pair it with the ugliest shoes you've ever seen, and somehow make the most wildly absurd combinations seem hip. Sometimes I think it's a little joke he's playing on the world. The runways are focused on spring again, but I'm gearing up for fall. I recently purchased the mother load of fall and winter fabrics and have them piled high in my closet waiting to be sewn into something grand. I love autumn because there are so many pairing options. It's always fun to mix and match summer and winter clothes for a new look. I purchased a Carolina Herrera textured brocade and sewed it up into a skirt. Then I striped a black stretch charmeuse with a black lace for a top. Here's to a new season!